Need a place to slow down and catch your breath? There is nothing quite like a water garden for relaxation. Whether you build your own or let the professionals at Riddle Landscape build one for you. A water garden is always a source of pleasure with ever changing sounds, colors, and textures. Add a bench and a chiminea and you have an outdoor spot for year round enjoyment. We carry a wide variety of water and bog plants including 15 varieties of lotus, irises, reeds, lilies, and bamboo. 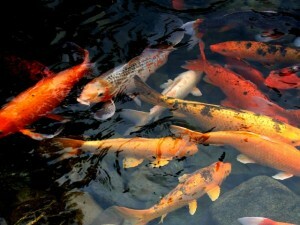 We also have in stock many varieties and sizes of koi fish and fish supplies.